Observing others’ classrooms and having someone observe yours are two of the most useful activities for teachers to improve their practice. (I’m not talking about evaluation observations; just the opportunity to see how other classes work). 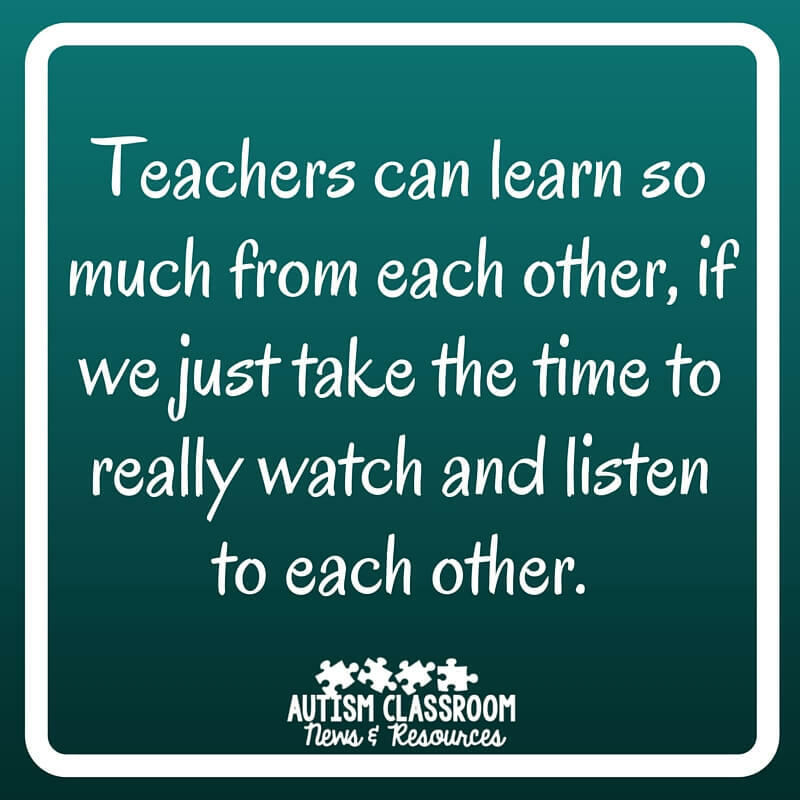 Let’s face it, many teachers in special education are the only classroom like theirs in their building, so it is not like they can just hop next door during their “planning” time (if such a time exists). You don’t get the benefit, in many schools, of teaming up with teachers with similar classrooms. Even those who support students who are included in general education are often the only one supporting this type of student. So although those teachers see others’ classes, they don’t necessarily see how others might support those students. There are so many reasons that observing someone else’s classroom is beneficial to your own teaching. After all we model skills we want our students to learn and grow from, why wouldn’t we do the same? Cult of Pedagogy has an excellent post about the advantages of observing in someone else’s classroom so I’m not going to any further in why observing other classes is good. However, I do want to talk about making sure you get everything out of the opportunity that you can. We model skills we want our students to learn and grow from, why wouldn’t we do the same from other teachers? Just as you would always carefully choose a model to teach your students, you need to make sure you choose a good example of a classroom to observe. Ideally it would be a classroom with students similar to yours. If that’s not available, then you can either find a classroom closest in student makeup to yours or go out of district to find classrooms to observe. Ask special education administrators and coaches for ideas of who to observe. I frequently have people ask me for suggestions of classrooms to observe in other districts where I work or special ed. administrators who can ask other administrators if there are classes that would be good for a teacher to observe. I hate to say this, but don’t just assume that if you know another teacher that she is a good example. You want to choose someone who is comfortable in his or her classroom and someone who has some experience and skills. What are the areas that you think you might be struggling with in your classroom? What are the areas you really want to see in his classroom? Are there things you are trying to figure out how to organize, arrange, or teach? Make a list of those so you don’t leave the observation and realize you forgot to ask about them. If there are organization of materials questions you have, ask the teacher when you set up the observation if it’s ok for you to look in her closets. You can learn a lot by looking in others’ closets, but sometimes what you learn is a little personal. So it always pays to ask. If you have a choice of when to observe, try to choose a time that covers the areas of concern from above. 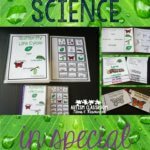 You also might want to include both whole group, small group and individualized instruction. I like to observe in the morning because often that is the time that the classroom focuses the most on heavy-duty instruction. Clearly you have to check to see when they are in the classroom and what their schedule is to figure this out. The teacher may also be able to give you some hints about it. Establish with the teacher when you are coming and how long you are going to stay….that way you both know what to expect. Ideally you can try to schedule it so that it backs up to some time she might have to answer questions, like a planning time or the students’ lunch time. Remember to bring the list of questions you made above. I also encourage bringing a notebook to jot things down on. That way you will remember what you saw and be able to ask questions when you have the chance. Pin me to read later! Remember that you are really a guest in someone else’s class. The teacher has enough to manage without worrying about when you will arrive and your arrival is likely to cause some disruption to the classroom that he has to prepare for. Just be aware of that when you walk in. My goal in an observation (whether for a student or a classroom) is to be as unobtrusive as possible. You want to see what the day looks like on a regular day so you don’t want your presence to disrupt it if possible. I always tell teachers that they should tell me where I can be out of the way and if I need to move to be sure to tell me. Stay off your phone, even texting, unless it’s an emergency. I will sometimes take notes on my iPhone but if I do I let the teacher know that’s what I’m doing. I don’t want the teacher to feel that I’m not observing, which would be disrespectful of her invitation to visit. Picture taking can be very helpful in remembering strategies and tools that are used in the classroom. However, pulling out your iPhone in the middle of class can be very disruptive for some students. Ask the teacher before you pull out your phone to take pictures if it is ok. Ideally do this before you set up the appointment. Never take pictures of the students. Wait for the students to move on before you take a picture of the area or tool. For confidentiality, you should never walk away from the classroom with pictures of the students on your phone or camera. If you see the class being distracted by your picture taking, stop doing it. Perhaps there is a time when the kids are out of the room that you can resume. NEVER post the pictures on any social media without discussing it with the teacher. Since you have not taken any student pictures, it should go without saying that student pictures NEVER get posted on social media. However, before you post pictures on Instagram or Facebook, see if it’s OK with the teacher. She may not think it’s a good idea because students’ names are posted in the room or whatever reason. Remember you are a guest here. NEVER post on social media while doing the observation…as noted above, it would be disrespectful to the teacher. When I do an observation for consultation, I usually start with the global way the room is setup and work my down into the programs of the individual students. I would suggest looking at the following areas as a starting point and of course there might be areas you are specifically concerned about. The room structure as a whole–how are areas divided? how is the furniture used? How are materials organized in the instructional areas? What is the daily schedule like? How long are the time periods for activities? 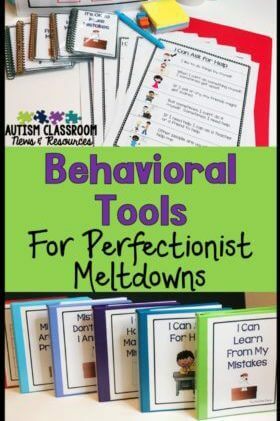 What types of visual supports are being used? What type of instructional strategies are being used in the classroom? How is data collected? Analyzed? Stored? How is large group material stored and organized? Is there a staff schedule or zoning plan? How well do staff work together? Can you tell what skills are being targeted in each area? How can you tell? How does that compare with what you do in your classroom? What types of behavioral supports are in place? 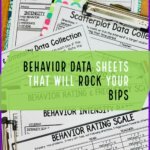 Do students have behavior plans? What do they look like and how are they implemented? I’m sure I could come up with tons more questions, but those give you a general outline of things to think about. 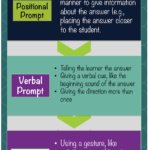 If you don’t have time to ask questions of the teacher directly after the observation, follow up with a phone call if you arranged it ahead of time. Otherwise, it’s nice to send her an email or a short note just thanking her for the opportunity to observe and I think it’s nice to mention some things you found useful or liked about his classroom. Then, start thinking about your own classroom in comparison. Don’t expect to remake the classroom you observed within your room. Instead, think of the things that might work well or apply for your students. Was there a specific instructional strategy that you would like to use in your classroom or a curriculum? Sit down with your instructional coach, administrators or special education director (or even just a friend) and talk about what you saw that might work for your classroom and what you saw that you might like to change in your classroom. Don’t try to change everything at once. You might have come away from the observation with tons of great ideas and you immediately want to put them into motion. However, it may not be the time of the year (like now, in April) to overhaul the classroom without upsetting the whole class. However, this is a good time of year because you can try things out and see if they work but not overhaul the whole classroom. Then you will have an idea when the new year begins of how you want to set things up and what has worked for you in the past. 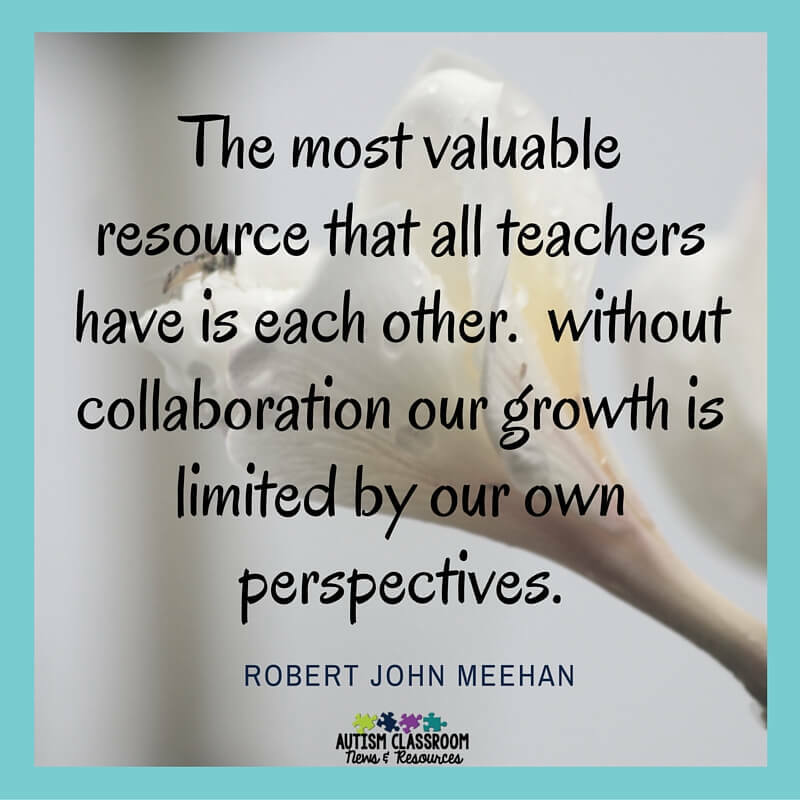 Being reflective in your teaching practice is the best way to grow as a teacher. I love my job because I get to go around to many different schools and districts across the country and take ideas I saw in one classroom and share them with teachers who will never have a chance to see that classroom where it originated. With the blog it has even a larger reach. However, you have to reflect on what will work for your classroom and your students. All classrooms are not equal; but the more ideas you have in your toolbox, the better you will be able to continue to refine your instruction to adapt to the needs of changing caseloads over time. If you didn’t get a chance to participate in the Blab this week, take a look at the replay below and be sure to share any questions in the comments. And I hope to see you next Sunday at the Blab when we will discuss preparing for other teachers or coaches to come and observe your classroom for constructive purposes (not necessarily required evaluations). 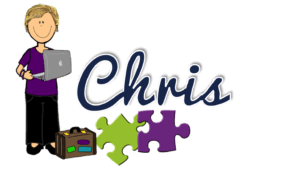 Join me next week, Sunday at 7 PM Eastern when I will be on Facebook Live on the Autism Classroom News Facebook page. That might be easier for people to access so I hope to see you there. If you can’t make it at that time, I will embed the video at the end of the post just like I do with the Blab! 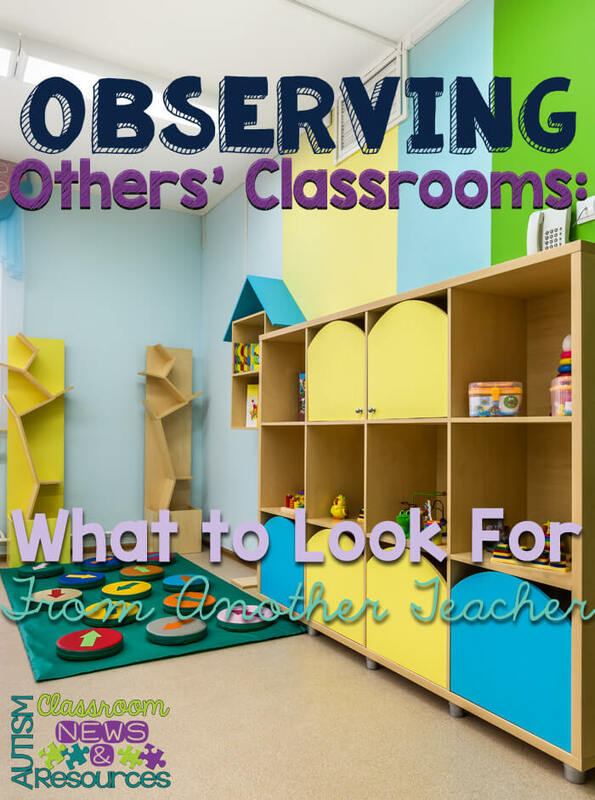 I really like your tips for classroom observation. Like you said, I agree that observing and being observed is something that really has the potential to help teachers develop. Seeing what you can do to help kids learn is always something I feel like people (especially teachers) should be constantly working on. Thanks for the insight!